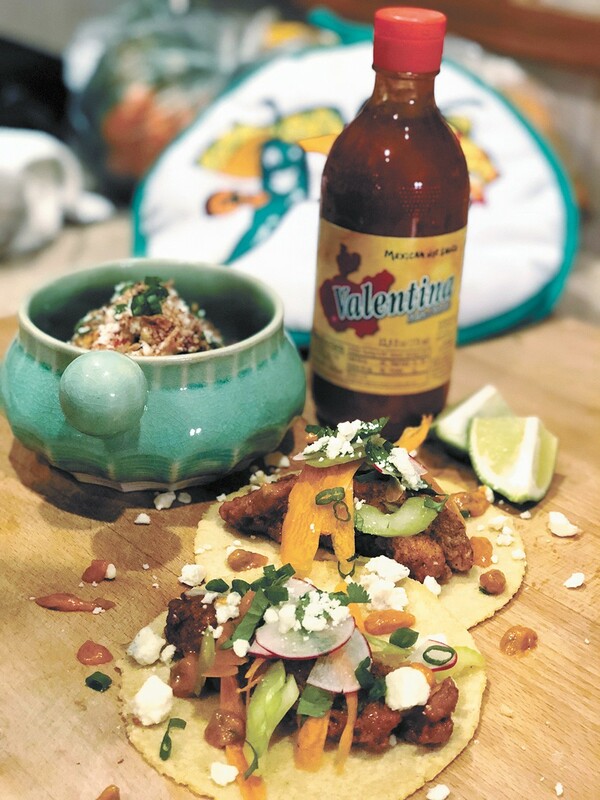 Fried chicken tacos and elote are featured on Cochinito's menu. Latin flavors are coming to the heart of downtown Spokane. Spokane chef Travis Dickinson, formerly the executive chef of fine-dining mainstay Clover, plans to open his first restaurant as a proprietor and chef by the end of this month. Cochinito Taqueria sits on a busy corner at Riverside and Post — the former home of Niko's — and will offer walk-up counter ordering for its fast-casual concept with a menu featuring a variety of street tacos, small plates, sides and taco bowls. The dishes and flavors at Cochinito will be traditionally Latin-based, Dickinson says, but with a fine-dining approach to preparation and ingredient quality, and sometimes a Northwest twist. "We'll still be doing fun and exciting things, but figuring out how to use use the tortilla as a vehicle instead of a $40 plate," he explains. "We don't want to set too many limits. Some things I have to do the traditional way, but others we get license to play with, and seasonality is going to be huge as we hit spring and summer." The Cochinito chef's passion for traditional Latin and Latin-fusion cooking began while working in the kitchens of several Portland-area restaurants alongside a dominantly Hispanic staff. "Even though these were Northwest-based restaurants, the crew meals were Latin in origin, and whoever would be leading those was Mexican or Guatemalan or Honduran," he recalls. "I grew to love the food and the flavors: acid driven, spices and big, bold flavors." The chef's ties to Latin cuisine grew even deeper when he met his Mexico-born wife, Karina. Dickinson lists off a few of the proteins he's featuring on Cochinito's tacos, which all begin with house-made corn tortillas: pork cheek carnitas, poached octopus, braised lamb birria, a 20-hour, sous-vide cooked tri-tip carne asada and even buttermilk-battered fried chicken. Tacos will range in price from $3.50 to $4.75 each, complemented by soups and salads at $6-$8, and starters that range from house-made tortilla chips with salsa and sikil pak ($4), a creamy pumpkin seed dip, to composed plates, like sopes ($12): thick fried corn cakes topped with a spiced duck confit, mole poblano, candied pepitas, cotija cheese and avocado. Vegetarians (and vegans, depending on the dish) are well-treated at Cochinito, with dishes like the Brussels sprout and wild mushroom quesadilla ($8) or the elote bowl ($7) of grilled corn, cumin and smoked paprika crema topped with scallions, jalapeno and pickled onions. Partnering with Dickinson on the project is Justin Curtis, former front-of-house manager at Clover, and a third investor. Since just days after Dickinson began working at Clover in the fall of 2014, he and Curtis began discussing future dreams to open their own spots. "The more we ran through the plan and got to know each other, we thought we can make a go of this," Dickinson recalls. "As far as leaving [Clover], when we got to a point when we had a lease signed and knew what we were doing, we were transparent and stuck around to take care of them through the end of it." As they set out to pursue becoming local business owners, Dickinson and Curtis left Clover in good hands, having both trained and closely worked with their successors, chef Cody Geurin and manager Steve Marriott. In keeping with Cochinito's casual, approachable vibe, customers who enter the restaurant can immediately grab a menu and a drink to start sipping as they ponder their many options. A focal point of the restaurant's colorful and rustic-infused space, along with a huge Dia de los Muertos mural on the back wall, is a massive wood cooler from the 1920s that houses self-serve beverages. With no formal table service, customers order and pay at Cochinito's main counter, which also serves as its full-service bar. Beyond a variety of canned and draft beers, wine and non-alcoholic sodas, the restaurant serves house-made horchata, and a variety of Latin-inspired cocktails: margaritas, daiquiris, sangria and more. Cochinito's cocktail program, led by Curtis, aspires to be on par with the variety, creativity and attention to detail as what he established at Clover. The original print version of this article was headlined "Taco Time"